Michael Doolan – crackle… & splat! There’s trouble in Toyland again. The Lego cowboy has drawn a gun. A fingerpuppet giraffe lies motionless. The green alien is stupefied, looking on. It’s all come down to a single stalled dramatic turning point in the game. In isolation, each figure registers a simple emotional state – a smiling face, a blank stare, a grimace. But in their studied arrangement, in the craning neck of a bear or its look of astonishment, in the slumped resignation of a soft toy or the rigid bearing of a plastic soldier, the figures act in concert to portray a range of contrary responses to each unspecified dire prospect: shock and horror at brutal vengeance; disbelief at the double-cross; or a slow dawning that something is dead, has dropped out of a tree – ‘splat!’ – right in front of them. There are neither children nor adults in Michael Doolan’s tableaux, only conflicted notions of right and wrong, left behind to animate each scene teetering on the verge of morality. These seem like moments of emerging adulthood in the games of children, just as the institutions of rational law and morality or war might derive from impulse, desire, and reflex actions. The fixity and fragility of ceramics – as opposed to the malleability and movability of many toys – are perfect means for Doolan to arrest human development at these precise moments of infantile predilection, when our futures are set in train and our adult lives come into view. First, Doolan recomposes various iconic toys, converting a soft toy to plastic or matching the buttons of one thing with the braces of another – only a connoisseur of toys could tell. He then re-creates the surface texture of soft fabric, hard plastic, even mirror, in intricate hollow forms using traditional coil technique. He matches these various materials with glazes that are fired up to a dozen times, pushing the tensile limits of clay. Thus Doolan restages the transition to adulthood through a complex material transformation. In a digital age, we might take such transformations for granted. But don’t forget these scenes are hand wrought, even though they seem more likely to derive from Photoshop than the first pots of human kind. And although they are clearly part of an epochal fascination with animated toys played out in digital animations like Toy Story, they are also radically different: dirt, not pixels. 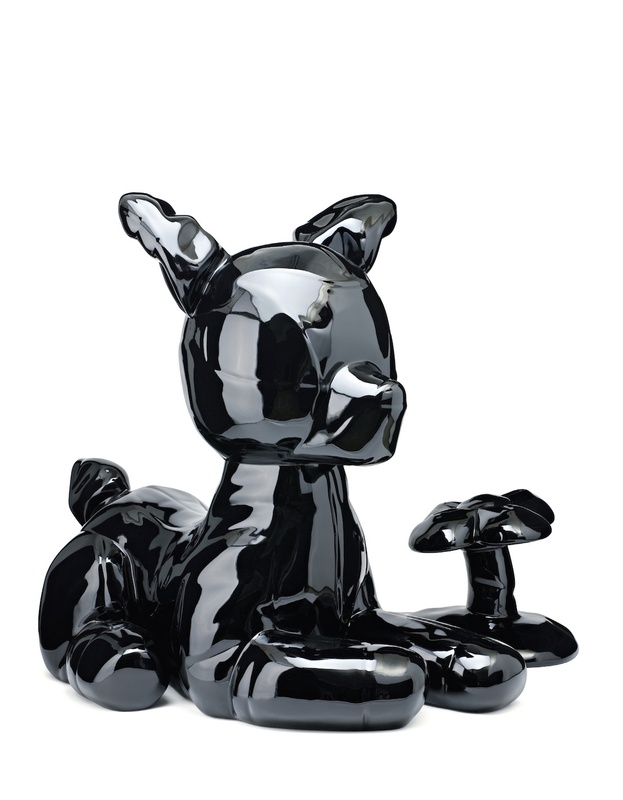 Even Doolan’s two-metre-high digitally lathed sculpture of Bambi derives from a foot-high original ceramic. Technology merely exaggerates the handmade curves, the final form testament to the carving, gouging, pinching, moulding, and smoothing at its genesis. Indeed, most of Doolan’s work retains a distinctive shimmer, the memory of ribbed clay just beneath its illusory form and glaze. And increasingly the toys seem aware of their transformation in clay, set at odds with their original purpose, fixed and confounded: a teddy bear upended on its head, crumpled under its own earthenware weight; massing blue Plan Toy figures unable to enter their own matching blue house (because they don’t have arms, legs, or mouths, and their house doesn’t have doors or windows); a toppled bird unable to right itself sits pathetically at the foot of a branchless tree. In each case, a simple dysfunction is raised to unbearable pathos. In fact, any agency or motive that may have been impugned in earlier works is increasingly diminished in the growing chorus of isolated characters that Doolan has rendered inert and passive in mirror finish. Profoundly ornamental, these figurines do nothing but reflect what is going on around them. Indeed, the closer you look, the more you see yourself in their shimmering featureless forms. No matter that they are dressed for work, ready to drive a train or dig the garden, the proletariat of Toyland is evidently useless. Elsewhere, the dumbfounded moose stalled in front of us has come to the same fork in the road, but the sign lies broken at our feet. Bambi, the cute motherless buck, rigid with fear, is isolated in our scope, caught unknowing in the crosshairs. The 10x model of Fifi the Flowertot in luminous yellow doesn’t just have a blank expression; she has no face at all. These moments-set-in-stoneware (“for now and for ever”, as Doolan sinisterly observes) are truly life-size monuments to our own terrible incapacities as adults: to find our way, to defend ourselves, to express ourselves, to feel anything at all. What I took to be a dilemma in the games of children seems more like a complete moral breakdown in the end, which has rendered the procession of Toyland not just in trouble but quite hopeless. The hardening of clay is like a settling tragic fate that can only be smashed from above, and, far from celebrating childish delight, Doolan’s work is a cautionary tale about our worsening prospects as adults.